During Copesan’s annual conference, which took place last month in St. Augustine, Fla., the service provider teamed with Syngenta Professional Products to raise funds for scholarships and research support. Conference attendees, including members of Copesan’s Partner network and pest management suppliers, raised $3,719 to support the Pest Management Foundation for research and Pi Chi Omega for scholarships. Copesan matched this amount for a total donation of $7,438 to be equally divided between the two organizations. Additionally, a unique “Arthropod of the Hour” clock titled “Beetlemania” (pictured above), featuring preserved insects on each hour of the face, was auctioned off, raising a record $2,150 was added to the donation amount for Pi Chi Omega. 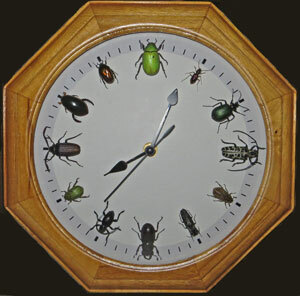 The clock was created and donated by Dr. Gerry Wegner, technical director and staff entomologist, ProGuard Commercial Pest Solutions of Columbus, Ohio, a Copesan Partner. Pi Chi Omega, a pest management professional fraternity, provides a number of $2,000 scholarships each year to deserving entomology students at universities across the country and around the world. The Pest Management Foundation has been providing grants for the research, development and refinement of pest management tools and techniques for more than 30 years. Sponsored by Syngenta, a long-time supporter of Copesan and this fundraiser, 2015 marked the 14th anniversary of Copesan’s Annual Charity Raffle. In addition to the raffle, Copesan further supports industry research with an annual $10,000 contribution to the Norman Goldenberg Research Fund, named after the 2008 PMP Hall of Famer.